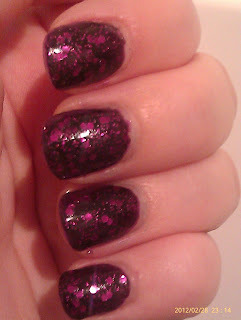 Facets of Fuchsia by Revlon is one of my favourite nail polishes! 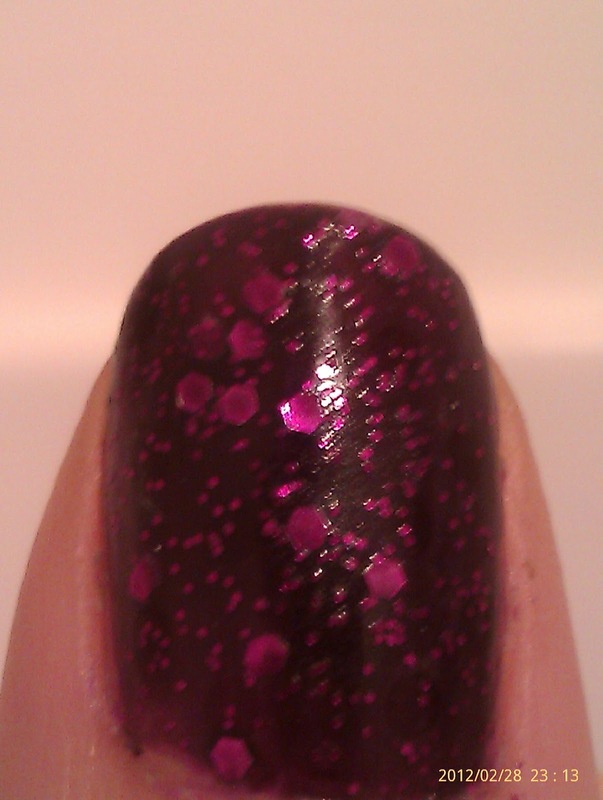 This is a dupe of Deborah Lippmann's Bad Romance. It is now called Scandalous (which doesn't have the same ring to it), as it has been re-released and renamed since I bought mine. When it was first released I went all over to find it... but they were sold out everywhere! Finally they had ONE in stock in one of the many Boots stores I tried :) I was never going to give up.. I was like a woman on a mission! lol. What is great about this nail polish is that you get soo much glitter in the bottle. 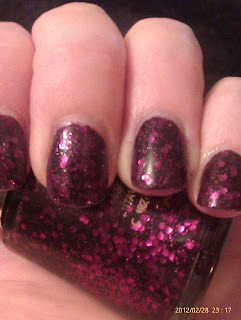 Two coats is recommended and if you wish to build up the glitterness you can apply more coats. However, on this mani I only applied one coat - but this was over my previous purple mani (as I got bored of it). So if you want less glitter I suggest you apply one coat over a dark purple or black. This is very pretty. I like it! Haha I also kept getting confused about the names because I bought it as Scandalous (and its now one of my favorite polishes too!) but I kept seeing posts about Facets of Fuchsia and thinking hmmm I wonder what the difference is between them... so thanks for clearing that up! And I agree, Scandalous doesn't have the same ring to it, Facets of Fuchsia is so much better! I love this colour heaps. . i always see it in the shops, but its $15. . i don't know how I feel about that! LOL. You have a great blog, well done!